Weighty Matters: A new staging system reveals new truths about the risks of obesity. A new staging system reveals new truths about the risks of obesity. There's a great deal of fear mongering out there regarding obesity, but is obesity really the killer it's made out to be? The answer's a touch more complicated than you might think, and new studies whose authors include some of Canada's brightest obesity researchers, are helping to shed some light on obesity's true risks. The first, published a moment ago in the CMAJ was written by Rad Padwal, Nicholas Pajewski, David Allison and Arya Sharma, and it detailed the use of the Edmonton Obesity Staging System in estimating obesity related mortality. The researchers used date from NHANES surveys to explore mortality as it would pertain to BMI versus the EOSS. When mortality was analyzed as a function of BMI, there was a fairly linear relationship that did not discriminate between overweight or the 3 classes of obesity (BMI 30-35, 35-40 and >40), however when analyzed as a function of EOSS, which in turn takes into account the existence and severity of weight-related co-morbidities, a very different picture emerged. 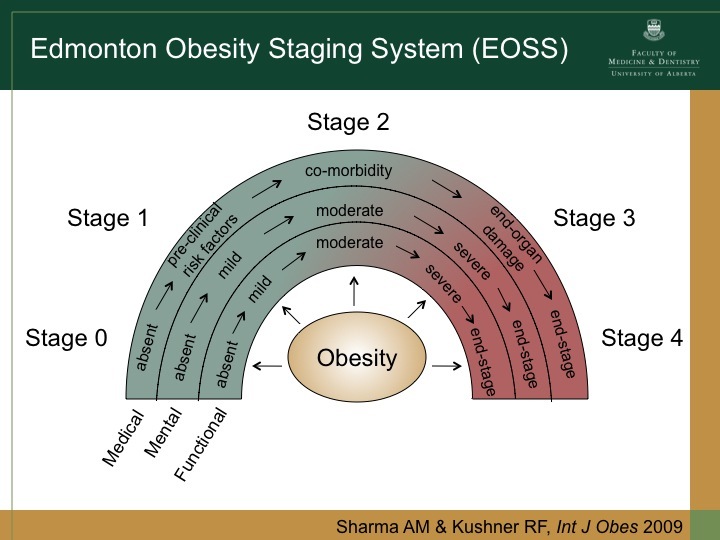 What was found was that as EOSS rose, so too did risk, and importantly, folks who were obese, but who did not have any weight related co-morbidities, over a 16 year span, showed virtually no increased risk of death, where as those with an EOSS of 3, only 60% survived the 16 years. The second study, authored by Jen Kuk, Chris Arden, Tim Church, Arya Sharma, Raj Padwal, Xuemei Sui and Steven Blair, looked at a different cohort of individuals, this time from the Aerobics Center Longitudinal Study. Their findings were almost the same. Folks with EOSS stage 0/1 had no greater risk of all cause mortality over 16 years, while those of EOSS stages 2/3 showed markedly increased risk. Importantly here, this study also controlled for fitness and dietary factors and found that when included in the analysis, fitness and improved diet eliminated the excess mortality risk for all but EOSS stage 3! These results are extremely important in that the EOSS is able to identify folks who are more likely to benefit from treatment. The flip side of that coin is that the EOSS is also able to identify folks whose doctors can stop lecturing them to lose weight, as at least from a mortality and cardiovascular disease perspective, EOSS 0/1 folks don't seem to have any increased risks. These results are especially important for countries like Canada where fiscal restraints and socialized medicine means that there is far more demand than supply for bariatric surgery. The EOSS may help to appropriately triage those folks who are most in need of urgent care. These studies also validate what I think most folks know to be true. Healthy lifestyles minimize weight related risks even in the absence of a so-called healthy body weight.